1. First of all, make sure your employees have no real direction, expectations, goals, or standards. After all, a good employee should be able to handle ambiguity, deal with paradox, and eat change for breakfast. No need to spoon feed them or spell things out for them – just give them the ‘old mission pep talk and turn ‘em loose! 2. Keep track of each and every time your employees mess up. Big mistakes, little indiscretions, and everything in between. Make a note to yourself and file it away in the employee’s folder. By the end of the year, you’ll a thick folder full of valuable performance appraisal feedback that your employee will surely appreciate. 3. Avoid frequent contact with your employees throughout the year. Keep your door closed, your calendar full, and try to look busy every time one of your employees stops by with yet another problem to discuss. Your employees might try to get you to have regular 1on1 meetings with them – avoid these at all costs! Nothing good can come out of these meetings. Employees are bound to try to bring you silly proposals, bad news, or problems to solve. You might even have to make a decision! 4. OK, now we get to the ANNUAL PERFORMANCE APPRAISAL. If you’re not careful here, this could end up meaning a LOT of hard work for you, so pay close attention. First, you need to prepare for the dreaded discussion. Ask your employee to make a list of 10 clients, co-workers, former bosses, and anyone else they’ve come in contact with over the last year. Then send an email to each one of them and ask for a detailed evaluation of your employee’s performance. This way, instead of just one person (you) doing all the hard work, you’ve now got 10 people doing it for you! And it’s a great way to pass along criticism and blame it on someone else. 5. Of course, the employee needs to prepare for the discussion too. Ask them to bring a list of measurable goals and performance expectations (that you never gave them) and their self-ratings. Hell, better yet, just have them fill out their own performance appraisal. But make sure you give them a day’s notice. 6. Don’t schedule too much time for the discussion – about 10 minutes ought to do it. If you talk fast, you can usually knock these off in about 5 minutes. 7. Now for your own preparation. Pull out that old “mistake folder” and get organized. The form will most likely have lots of categories such as “teamwork”, “accountability”, “judgment”, and the like. Plenty of categories to fill in a few mistakes for each. Give extra weight to things that have happened in the last couple weeks – these are the most important and should heavily influence your ratings. 8. 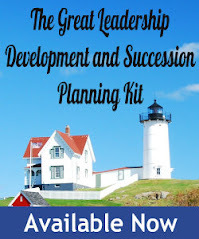 OK, now you’re ready for your 5 minutes of leadership brilliance. Invite your employee in, and make a little casual small talk. Then open up the appraisal with a compliment, some insincere meaningless praise, just to loosen the employee up and prepare them for the good stuff. Then let 'em have it. Go ahead, unload, both barrels, this is your moment! As you’re running through your list of mistakes, as well as any unsubstantiated criticism for others who have bothered responding to your survey, remind the employee that “feedback is a gift”, and this is your special gift to them. 9. Sometimes HR adds a page at the end of the form for “employee development”. Forget it, waste of time, just more HR rubbish. But if it needs to be filled out, have the employee do it themselves. This is called “having the employee take charge of their own development”. 10. End the appraisal with another insincere compliment. This is called a “feedback sandwich”. Doing this will ease the sting from all the criticism and leave the employee with a nice warm fuzzy feeling. That’s it! You’re done. Congratulations. Learn and follow these 10 steps and your guaranteed to have dissatisfied, unmotivated, unproductive employees, increase your turnover, and ultimately, lead yourself out of a job. Please comment if you have any more to add to the list. Just stumbled across your blog today. Very entertaining (and educational)! I'm posting an item about your list today on my Employment Blawg (www.manpowerblogs.com/toth). I think my readers will enjoy it. LOL - Awesome post Dan. Really enjoyed it! 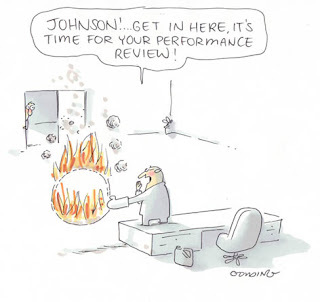 Oh my....were you in on my performance evaluation? My boss dragged out things that had happened months ago, not recognized the fact that I was at over 110% of my performance goal and basically poisoned me for moving to any other department at my company. Suffice it to say I don't enjoy my job and am "looking for a new opportunity." Sorry to hear that. Good luck with your search! The 11 th way is to schedule an appraisal discussion meeting and- not show up!